1. Instead of milk and cookies, leave him a salad and a note explaining that you think he could stand to lose a few pounds. 3. Leave him a note explaining that you've gone away for the holidays. Ask if he would mind watering your plants. 6. Leave a note by the telephone telling Santa that Mrs. Claus called and wanted to remind him to pick up some milk and a loaf of bread on his way home. 7. Throw a surprise party for Santa when he comes down the chimney. Refuse to let him leave until that huge cake arrives. 8. While he's in the house, find the sleigh and sit in it. As soon as he comes back and sees you, tell him that he shouldn't have missed that last payment, and take off. 9. Leave a plate filled with cookies and a glass of milk out with a note that says, "For The Tooth Fairy ????" Leave another plate out with half a stale cookie and a few drops of skim milk in a dirty glass with a note that says, "For Santa ????" 11. 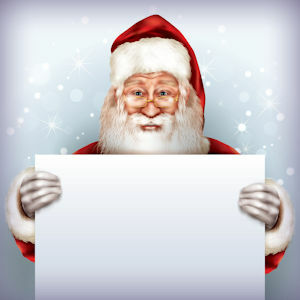 Leave out a copy of your Christmas list with last-minute changes and corrections. 12. Leave Santa a note explaining that you've moved. Include a map with unclear and hard-to-read directions to your new house. 13. Paint "hoof-prints" all over your face and clothes. While he's in the house, go out on the roof. When he comes back up, act like you've been "trampled." Threaten to sue.